Daniel Solis: Happy Birthday, Robot! Happy Birthday, Robot! is a storytelling party game for clever kids, gamer parents and fun classrooms. You and your friends tell a story about Robot. Robot meets new friends and learns new things about the world. 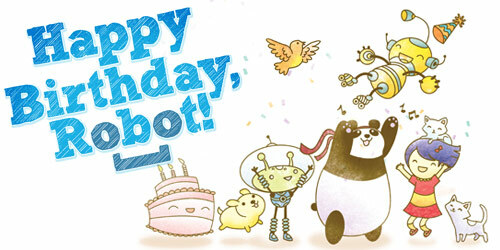 Robot's world can be different each time you play, but the story always begins the same way: "Happy Birthday, Robot!" Ennie Awards: Nominated for Best Game, Best New Game, Best Production Values, and Product of the Year! Here are some stories that came from actual players. The stories are very different from each other because each group was different. Sometimes they're pretty silly... Okay, they're all pretty silly... but still lots of fun to make. You can make your own story each time you play Happy Birthday, Robot! "Congratulations, you get to become a real boy!" The Professor cheerfully continues: "One catch: A boy must take your place!" Robot knows Bobby wants to be a robot, but he is grounded. But it's Bobby's birthday and he loudly wishes real hard. Professor hears Bobby's wish to become a real robot. Professor convinces Bobby's parents to unground him and allow the procedure, but it might be temporary. Bobby and Robot sit in the Switcheroo Machine, but it sputters loudly. Robot waits anxiously while Professor kicks it back to life. Bobby becomes Robot, Robot becomes Bobby, and Professor says with joy: Hello, Nobel Prize! Bobby likes flying around town with Robot's very shiny rocket legs. Robot likes eating pizza and playing with Bobby's little brother. Bobby misses pizza. Robot misses flying. They switch back. Robot awakens and sings until the sun sets. Sad and lonely, Robot's song echoes, hauntingly, but something answers his song. Surprised, Robot gleefully answers the song and intently listens to... a duck! "Will you be my friend forever?" Duck asks hopefully, and Robot nods enthusiastically. Duck dances a happy interpretive jig, and Robot begins singing to everybody. Nobody answered Robot's call for new friends until a quacking pig flew by. Pig quacked a greeting song, and Duck and Robot were happy, but then everyone slept. Robot, Duck and Pig snore-quacked loudly and everyone dreamed they were happy robots flying together with stars. Everyone except Robot slept until the wee morning, and Duck and Pig made breakfast for sad Robot. Sad Robot was happy he had friends like these. But Robot still could not fly. That night Pig and Duck taught him. Robot is very small, but has big heart. Robot misses friend Melissa, and she misses him as well. Robot finds Melissa at the Spaceport and Melissa is crying because her dolly is missing. Robot knows where dolly is, but cannot reach her without John's help. Robot asks John for help and John takes Melissa and Robot up into his spaceship. Robot is very excited, but still needs help to find Melissa's lost dolly. John, Melissa and Robot all see dolly and she's almost in reach of the spaceship! John says "Hold on tight!" and pushes the throttle to the max! The spaceship goes ZOOM! and dolly is recovered, much to Melissa's relief. With John's help, Robot saves the day. Robot laughs and dances the tango, but by himself. Robot's presents and the ponies are missing, but he isn't too worried. Robot thinks his friends--all but Natasha--rode the ponies away to the hills. Maybe Natasha, being a jerk, hid Robot's presents for a terrible surprise, but Robot loves her anyway. But now, Natasha comes bounding out of her cave, shouts "surprise," throws confetti, and hugs Robot sweetly. ROBOT: Are you teaching me a lesson that I shouldn't care about presents? ROBOT: Or are you just being a big MEANIE?!?! There was a robot, but he was rusty. So, for his birthday, he cried oil tears. Robot ran faster than ever before. He ran home and found rust-removal spray. Robot took a rust removal shower and scrubbed himself shiny. Robot felt better than ever, so he baked his favorite cake. Robot put candles on his cake and lit them. Robot looked and closed his eyes, but his cake moved. Robot screamed and his cake jumped, screaming "don't eat me!" Robot was confused, but agreed, and they sat and talked and laughed. Robot was going to wish for more friends before the cake came alive. Now, he didn't have to. And Robot never cried again. Robot's family of kittens has gathered many balls of yarn. Robot's kittens want milk, but they also want to hunt! "Ack!" says Robot. "I'm made of tuna cans!" Robot finds a bush of catnip nearby and quickly knits several tiny toy mice. Robot thinks this was a good first day of kitten school. My crew and I had to play HBR after tonight's show, turning what's normally a co-op video game wind-down into ... something much crazier. Something dark. Something ... horrible. HBR is a game for people who like to read but don't actually game with their children. for people who DO actually game with their children I suggest BoL or Cat or something more interesting than this for gods sakes. Even if you haven't read the actual book--by the brief description of it above, surely you understood this game's goals (which clearly aren't necessarily the same of a traditional RPG) and hopefully you understand the storytelling and game design philosophy of the author (which should be relatively clear to someone that has sought out this page and bothered to scroll down to comment), so why the bland backhanded dig, guy? I'm not speaking for everyone that might read this, obviously, but personally I'd rather hear you offer some real criticism, so that perhaps the people that HAVE actually gamed with their children using HBR (and had fun doing it) know exactly what they were doing wrong, for future reference.